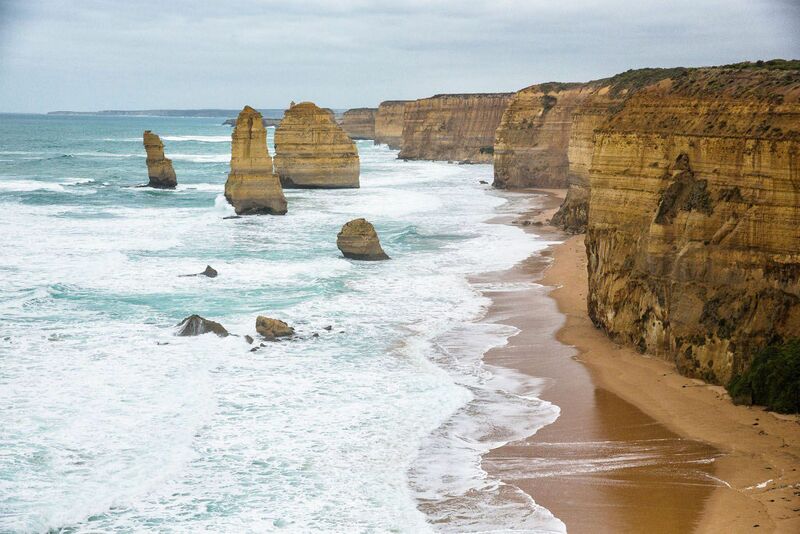 The Great Ocean Road is one of Australia’s great drives. It is comparable to Big Sur in California with coastal views, winding roads, and many, many scenic viewpoints. 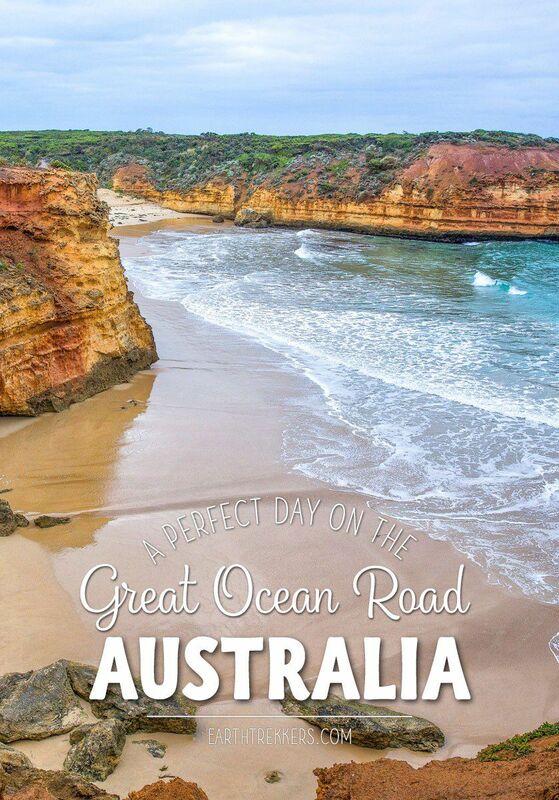 For many people, the Great Ocean Road is a highlight when visiting Australia. There’s a lot to see and do along the way. 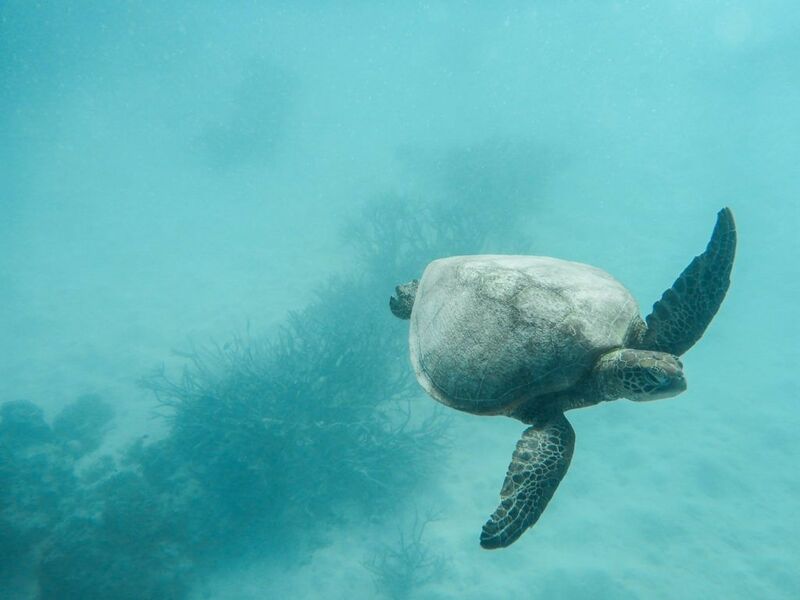 In this post, we cover the best spots to see along the way. 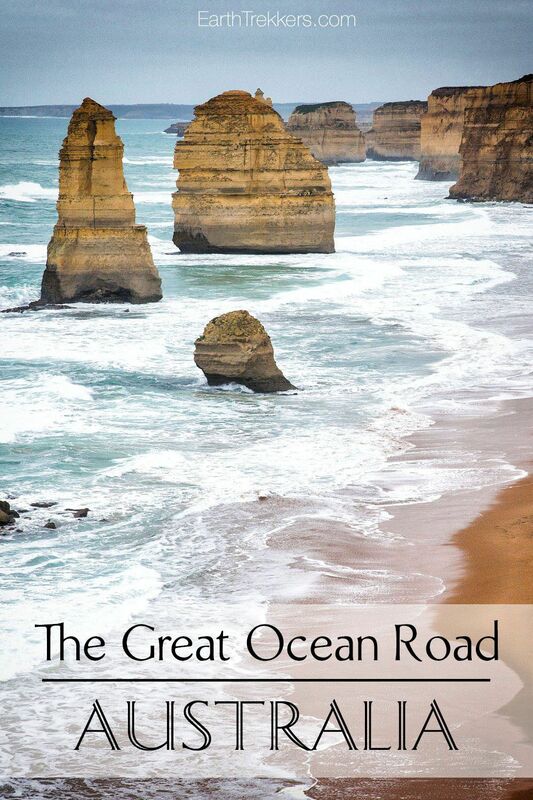 The Great Ocean Road spans 200 kilometers, from Port Campbell in the west to Torquay in the east. 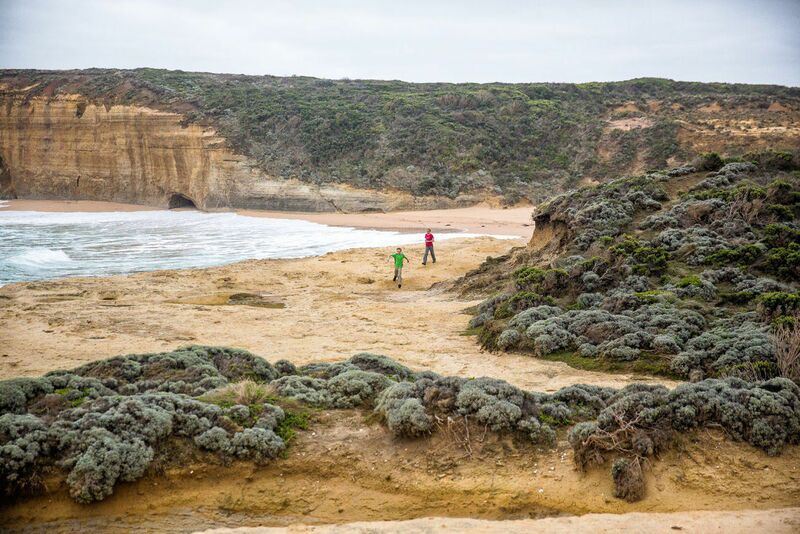 Some people do this as a very long day trip from Melbourne while others can take as long as a week, stopping at towns along the way, leisurely enjoying the beaches, wineries, and historic towns along the way. 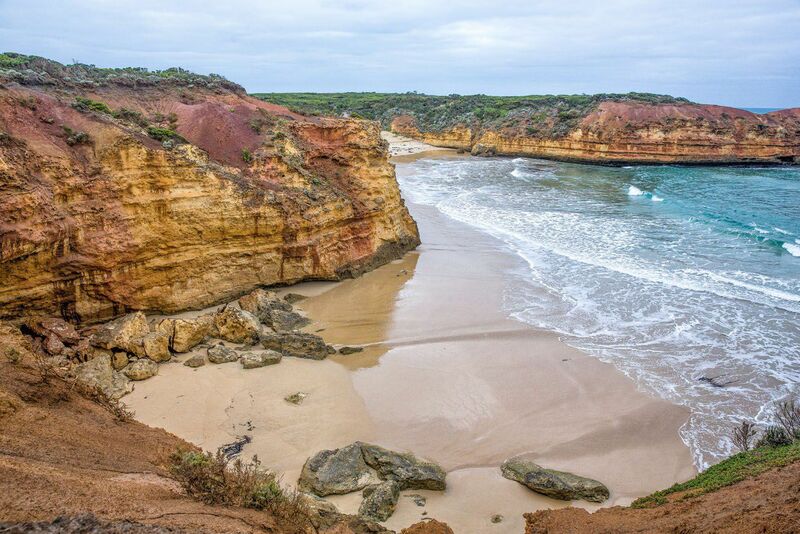 We had one day to drive the Great Ocean Road, including this in our travels from Adelaide to Melbourne. 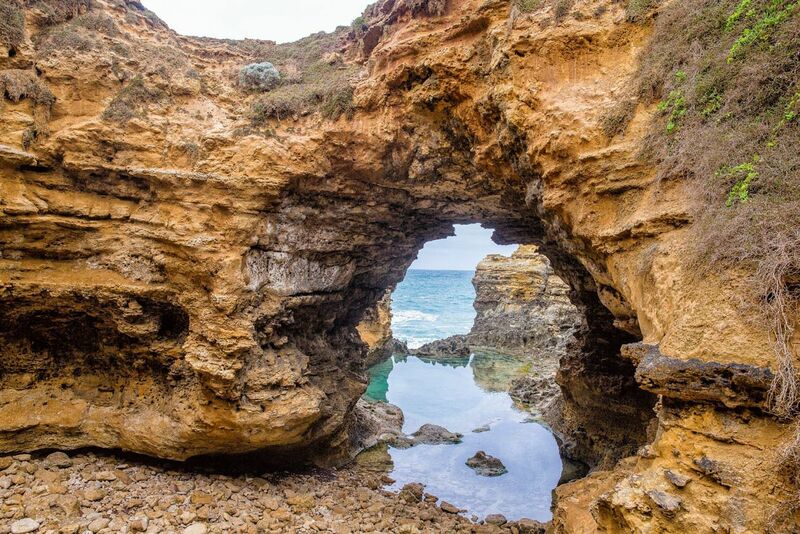 Most of the highlights are located around Port Campbell. 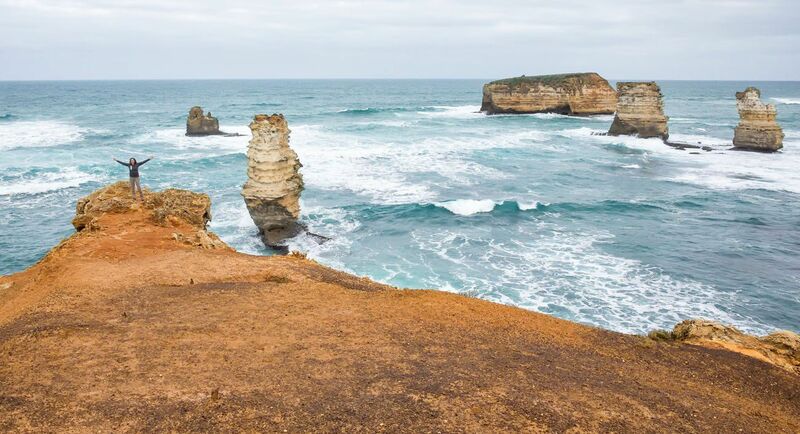 Here at Port Campbell National Park, we spent over two hours hopping from scenic view to scenic view. It seemed like there was another amazing view every 400 meters, so we were jumping in and out of our car a lot. It was in this area that we were treated to stunning views. 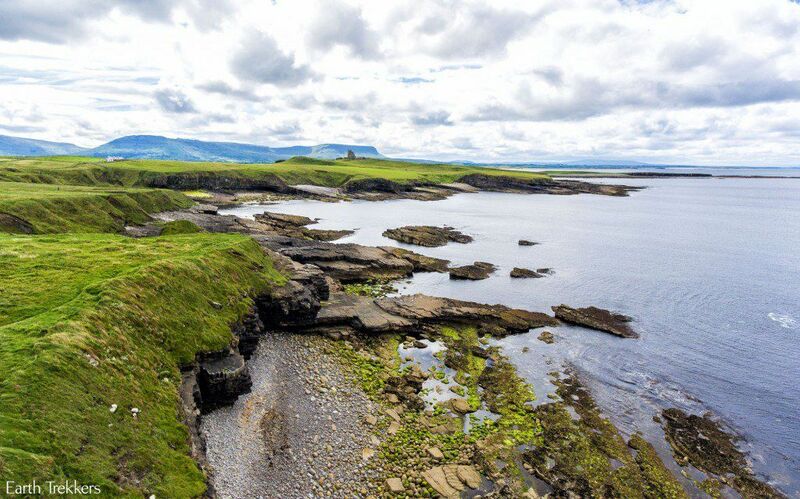 The coastline is awesome. Sandstone cliffs plunging into the ocean, pillars of hardened sandstone sitting just offshore, all of this being pounded by some serious waves. The waves here are huge and come fast and furious, making this area a great surfing spot. Next, we got off the beaten track, taking an unnamed dirt road towards the shoreline. We parked at a small car park and were the only ones here. A sandy trail took us down to a beach. Here we are, at another beach, and we have it all to ourselves. In front of us were walls of sandstone, giant waves crashing on the beach, and a rocky peninsula just waiting to be explored. While Tyler and Kara tried to throw each other off of the sand dunes, Tim and I went exploring. We walked out to the tip of the peninsula. Some of the largest waves I have ever seen were crashing onto the rocks, sending up sprays of water at least thirty feet in the air. We could not get too close to the edge or else we would risk being pulled into the ocean by a rogue wave. Tyler and Kara joined us, took a look around, and then went back to their game. It was awesome having this place all to ourselves, being able to explore without anyone else around. We spent forty five minutes here and during this time we did not see one other person. This would end up being our favorite part of the day. From the rocks, Tim and I could see a cave in the side of the cliff. 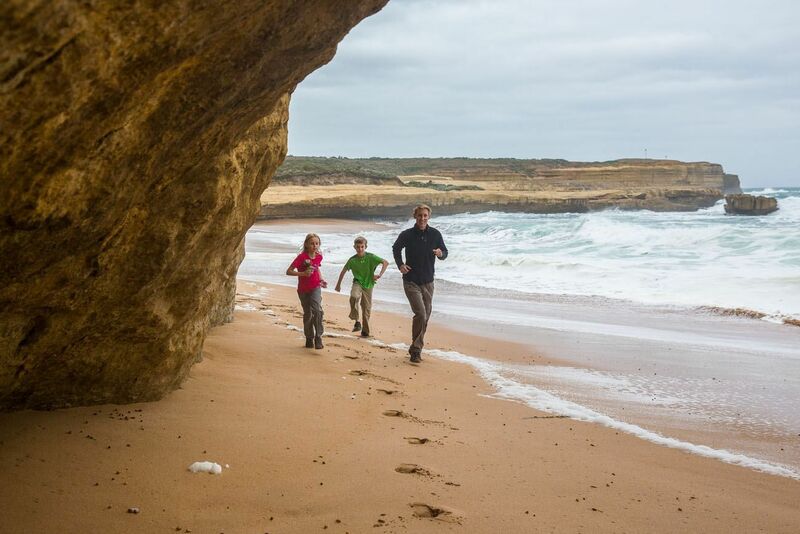 The four of us made our way over to the cave, dodging waves washing up onto shore with approaching high tide. The cave was not very big, extending about ten meters back into the cliff from the opening. For just a moment though, it was neat peering out at the waves and the coastline from this unique vantage point. Things all of a sudden became a lot more exciting. 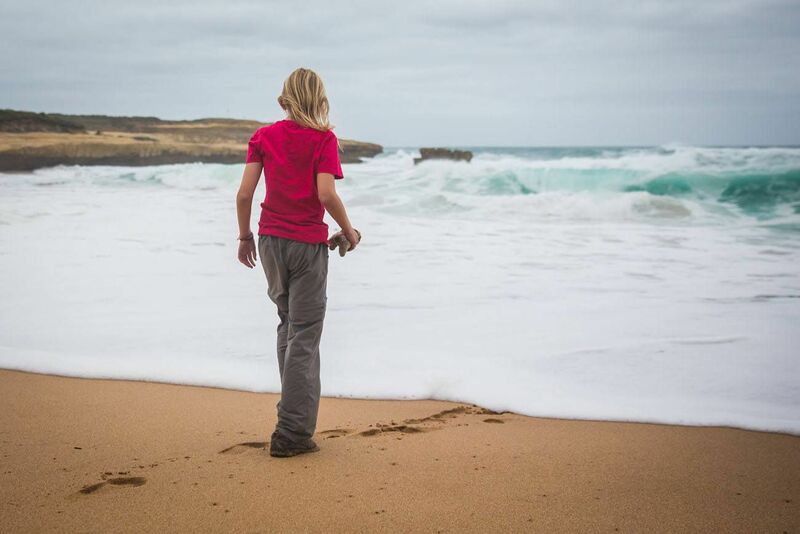 A large wave crashed on shore, quickly heading towards our cave and where we thought we would be safe. I dashed out of the cave to higher ground, able to stay dry. 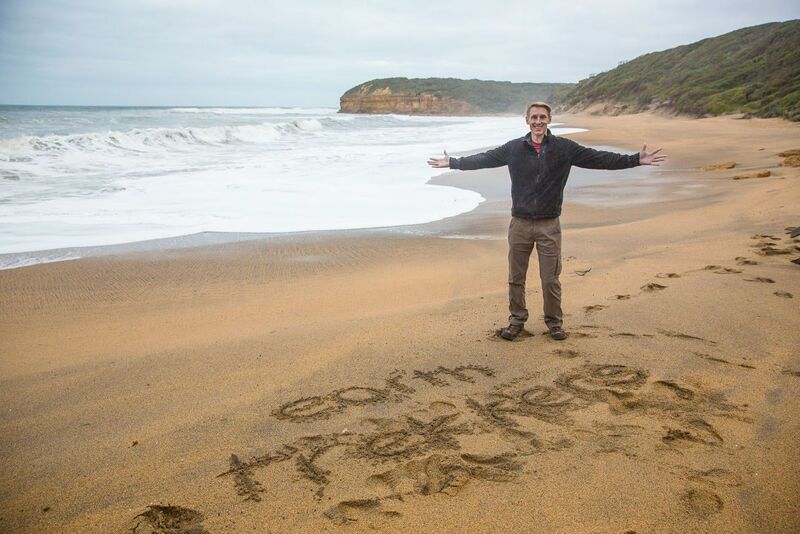 The same would not go for the rest of the Earth Trekkers. 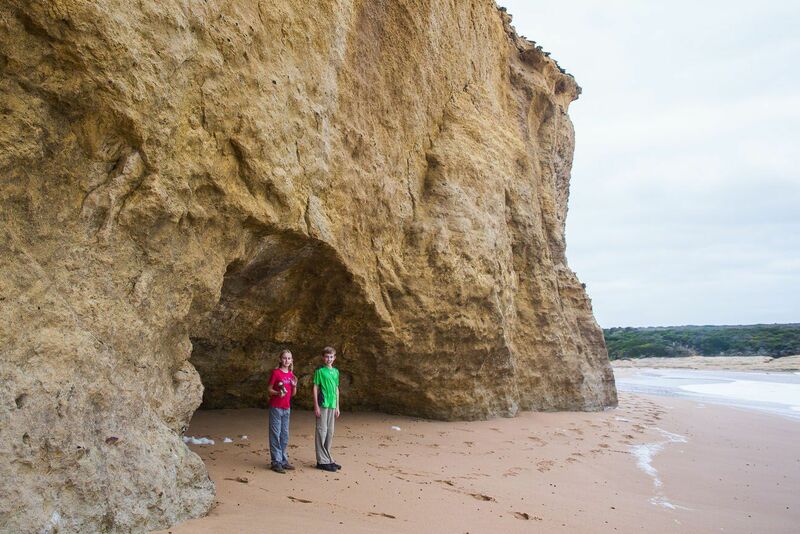 Tyler and Kara, since they were shorter, were able to retreat to the far depths of the cave, keeping their feet dry. Poor Tim got hit hard by the wave, soaking his feet. All the while, Tyler and Kara were screaming with delight, laughing afterwards. A few minutes down the road from Sherbrook West is a large car park with trails to various viewpoints. These are decent, but not as good as what you just saw, and definitely not as great as what you are about to visit next. 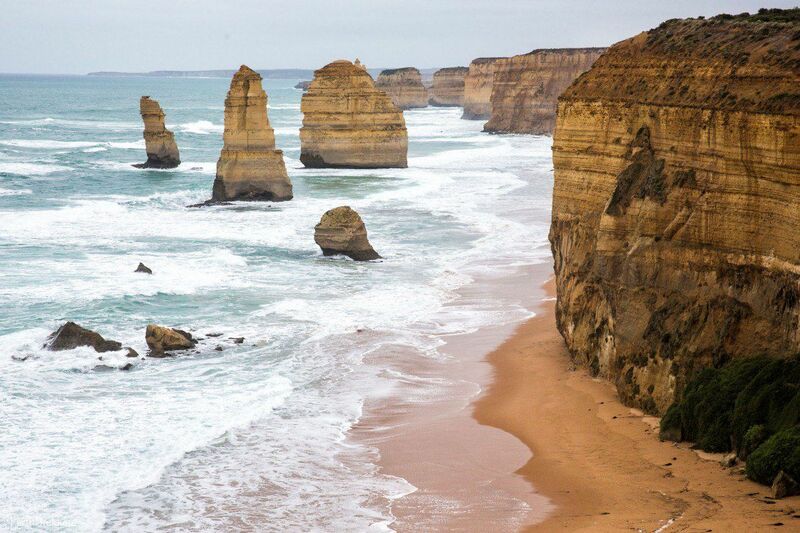 The highlight of the Great Ocean Road are the Twelve Apostles. 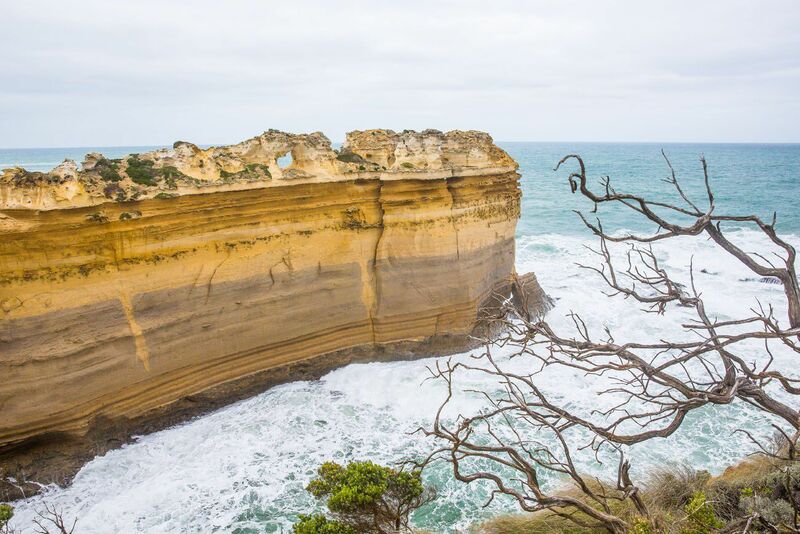 The view of these sandstone pillars along the coastline is one of the Great Ocean Road’s most famous. Here we joined the largest crowds of people yet, all elbowing for the best place to take family photos. Most of the people here were Chinese. Even in Australia, Tyler and Kara were getting a lot of stares, this time from Chinese tourists. Sometimes, Tyler and Kara feel like they will never be able to escape the attention of people curious about their blond hair. 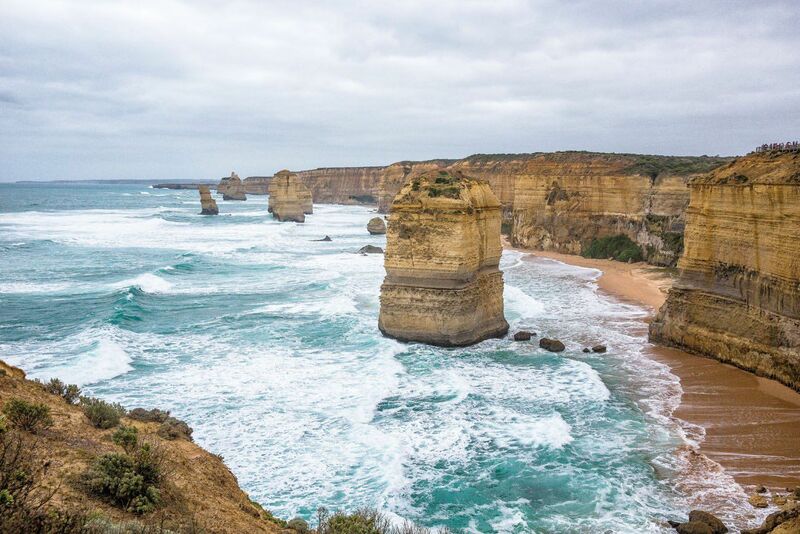 The Twelve Apostles marked the end of the most scenic of viewpoints but did not end our journey down the Great Ocean Road. We still had a long ways to go. 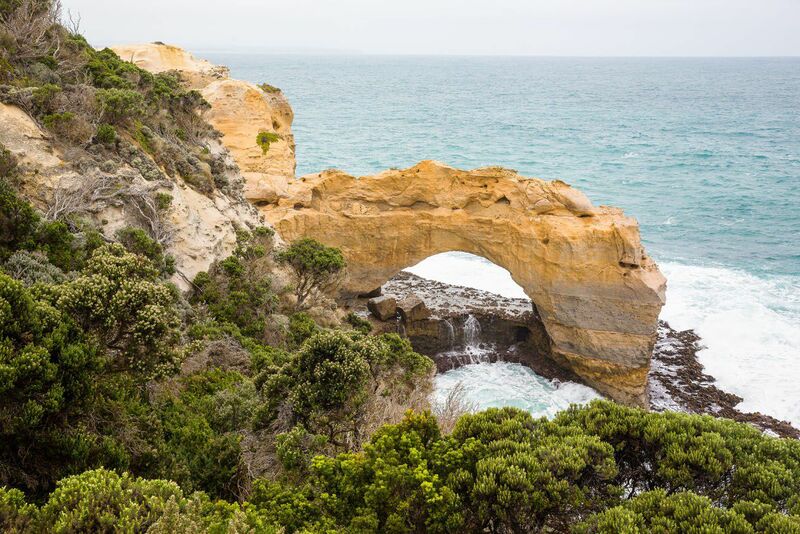 For several hours, we traveled along the Great Ocean Road, on very windy roads, through towns like Apollo Bay, Skenes Creek, and Lorne. This was not anywhere near as scenic as Port Campbell National Park but was still worth seeing. Well, at least until the constant winding roads started making Kara nauseous, giving her a front seat in our car and a dose of dramamine. 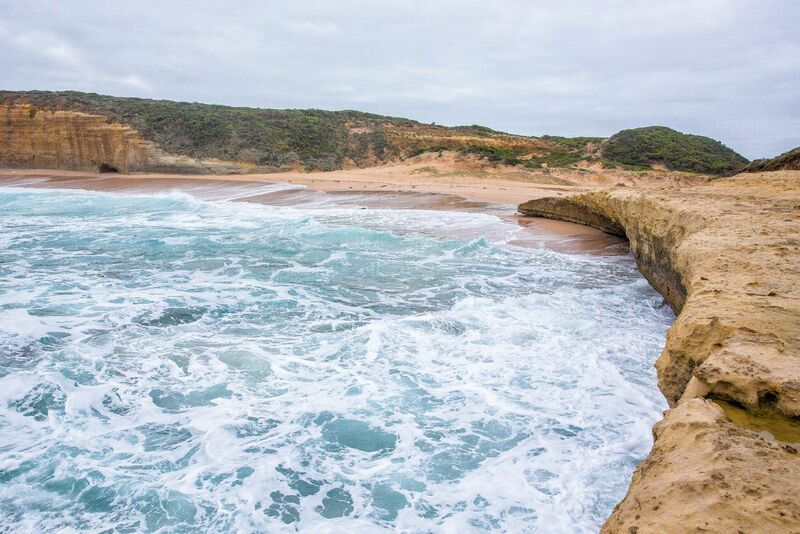 Finally, we made it to Bells Beach in Torquay, the end point of the Great Ocean Road. The four of us were ecstatic to be off those winding roads. 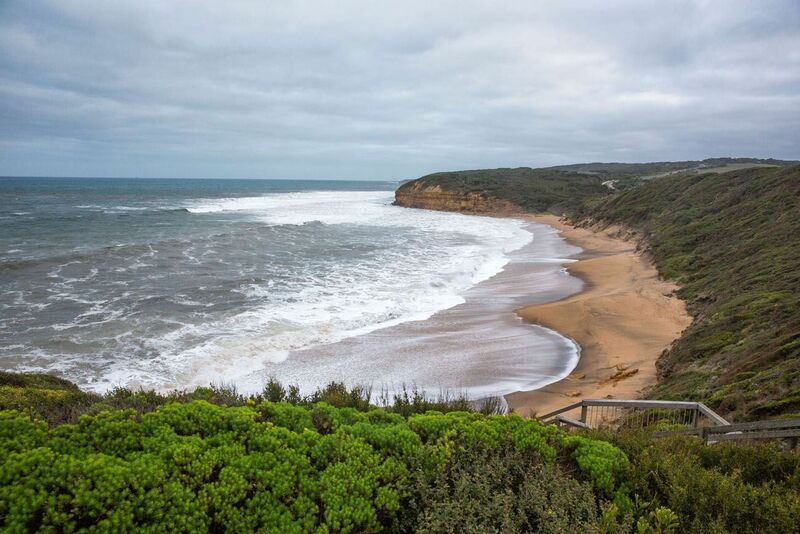 Bells Beach is Australia’s premiere surf spot, a spot also labeled by some as the best surfing destination in the world. Today, at 4 pm, with clouds and a cold breeze, it did not look like much to us. There were no surfers, really there was no one else here other than a few curious people like ourselves. The waves here were big, similar to US east coast waves just before a hurricane. I could not imagine trying to swim out past these waves, just to catch one right back to shore. It was another spot that was cool to see, even if it was just for a few minutes. Our journey ended an hour and a half later, finally at Melbourne. 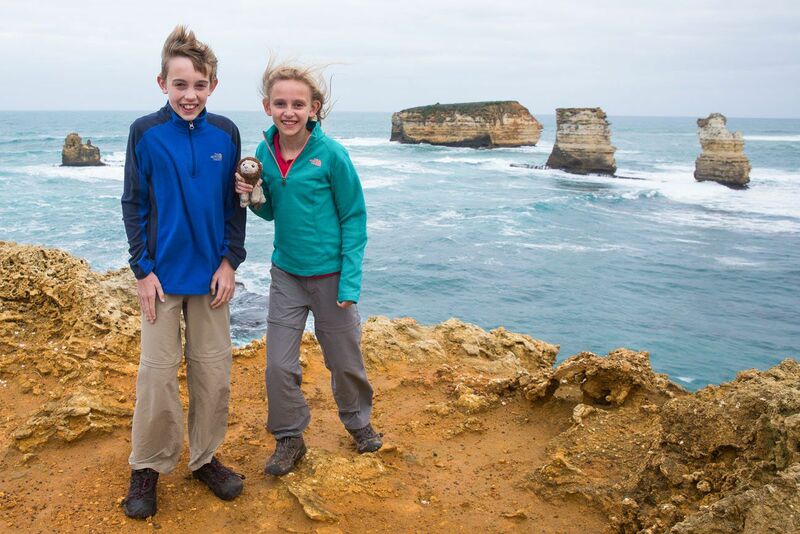 We enjoyed our travels on the Great Ocean Road, the area of Port Campbell National Park being the highlight of the day. 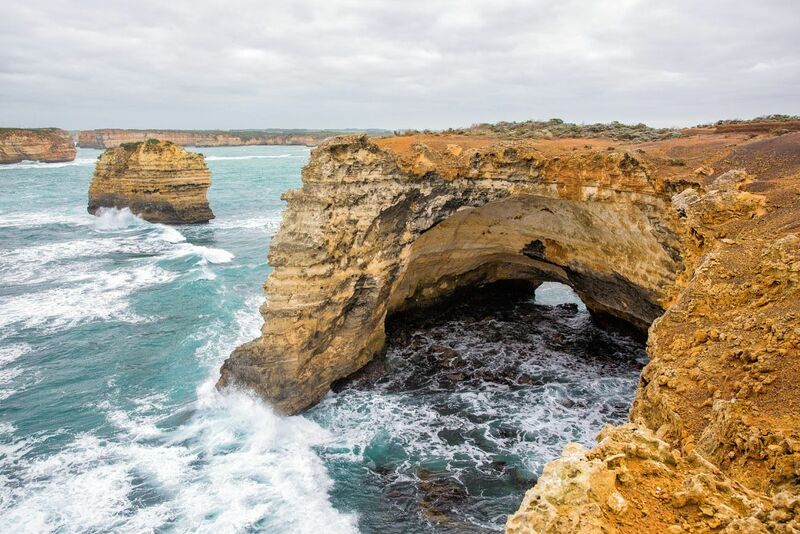 If you travel one way from Port Campbell to Melbourne (or vice versa), it is a 300 km journey. 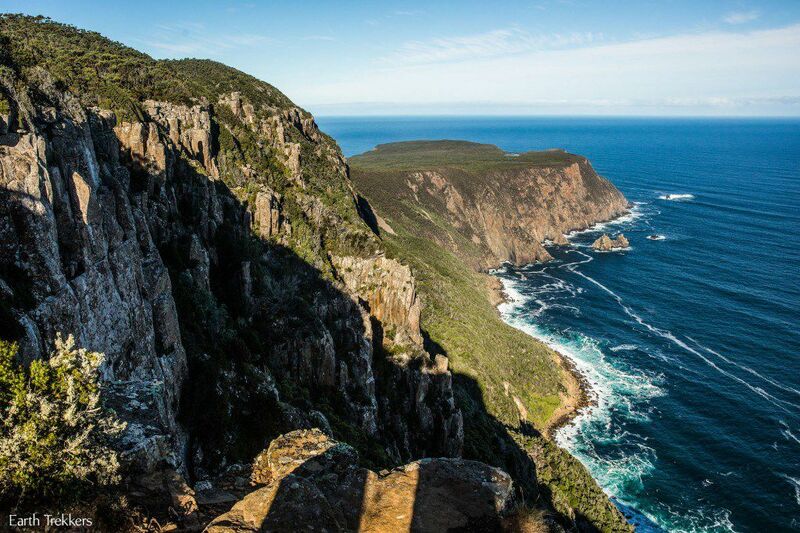 Once you factor in viewpoints and short walks, expect this road trip to take one full day. 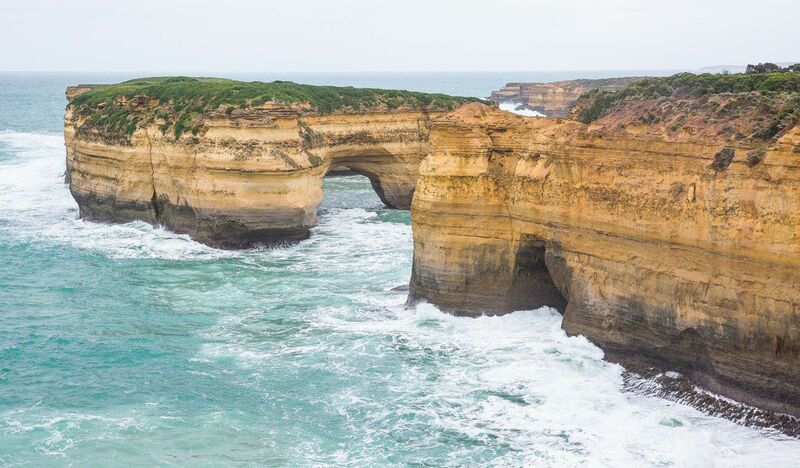 For those strapped for time, a visit to just Port Campbell would allow you to see the best of the Great Ocean Road, skipping the monotonous winding roads between Port Campbell National Park and Melbourne. 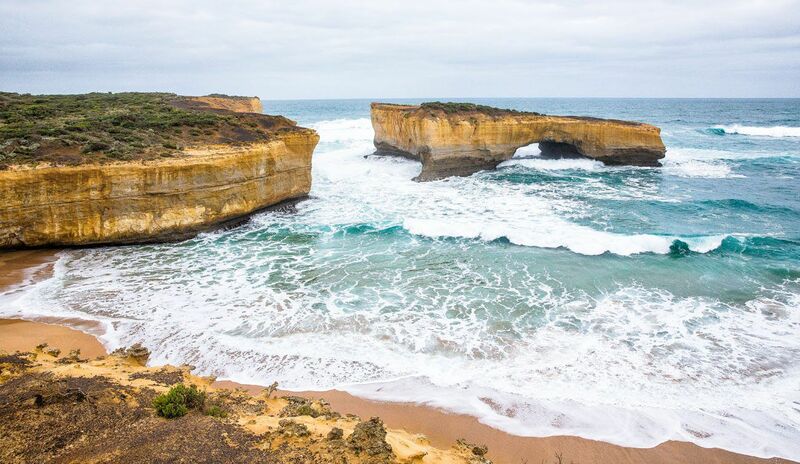 You could drive the main highlights of the Great Ocean Road (from the Bay of Islands to the Twelve Apostles), and then drive to Melbourne on highway A1. It’s not nearly as scenic to do it this way, but it does save you about 50 km and one hour of driving. If you want to get off the beaten path like we did, do not be afraid to try one of those unlabeled dirt roads. This is one way to get away from other tourists. 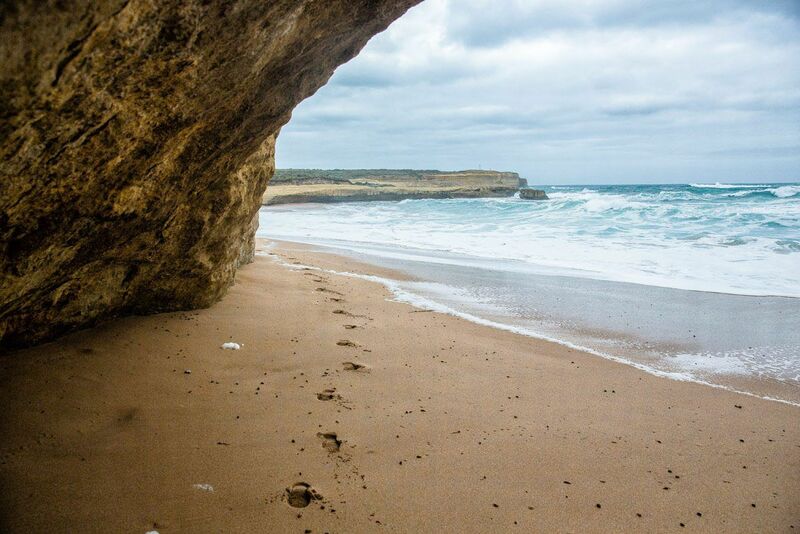 You might even get a stretch of beach all to yourself, maybe for the best adventure of the day. 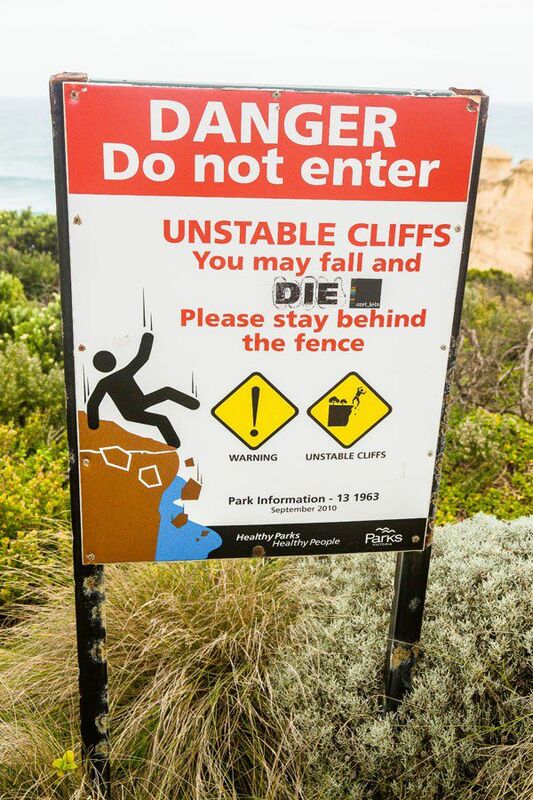 Yes, you can do this as a one day trip from Melbourne, but I don’t recommend it. It’s a lot of driving. 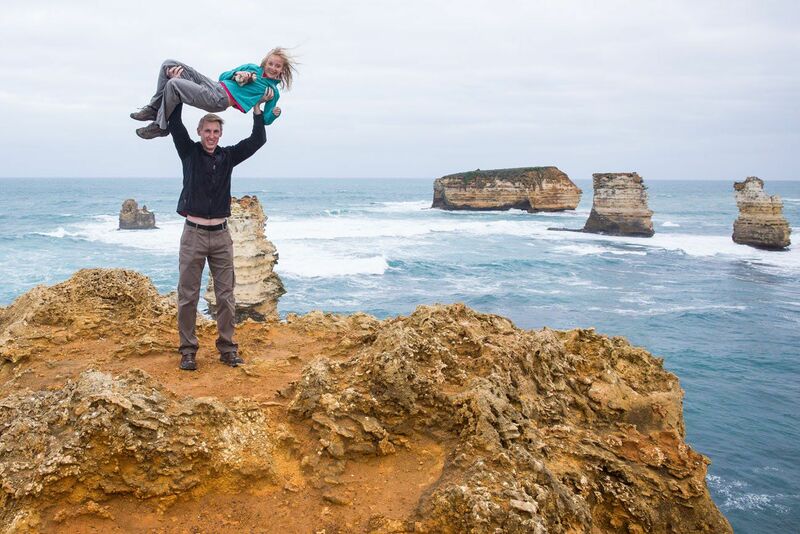 We drove from Adelaide to Portland, spent the night in Portland, and then drove the Great Ocean Road. Portland is 6 hours (540 km) away from Adelaide. 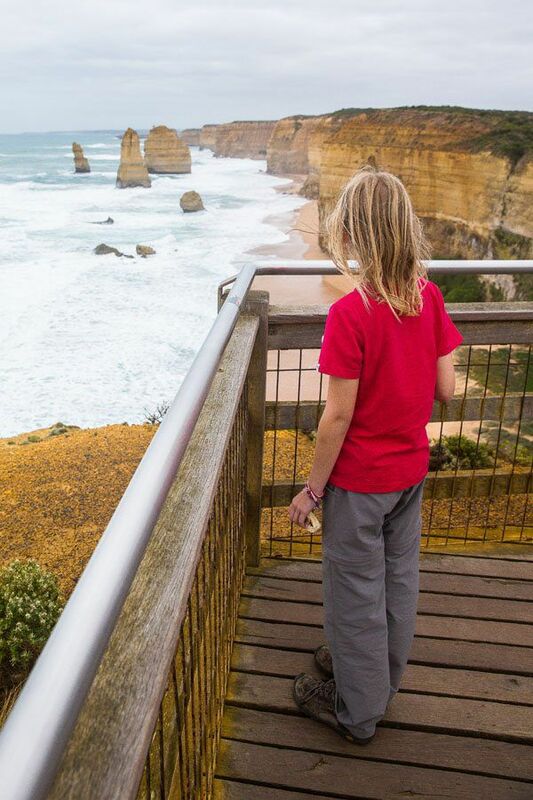 From Portland, we drove 2 hours (160 km) to get to Port Campbell, the start of the Great Ocean Road. In Portland we stayed at the Portland Holiday Village. We had a villa, a small, two bedroom cabin with a kitchen and ensuite bathroom. It was nothing fancy but suited our needs for our family of four. 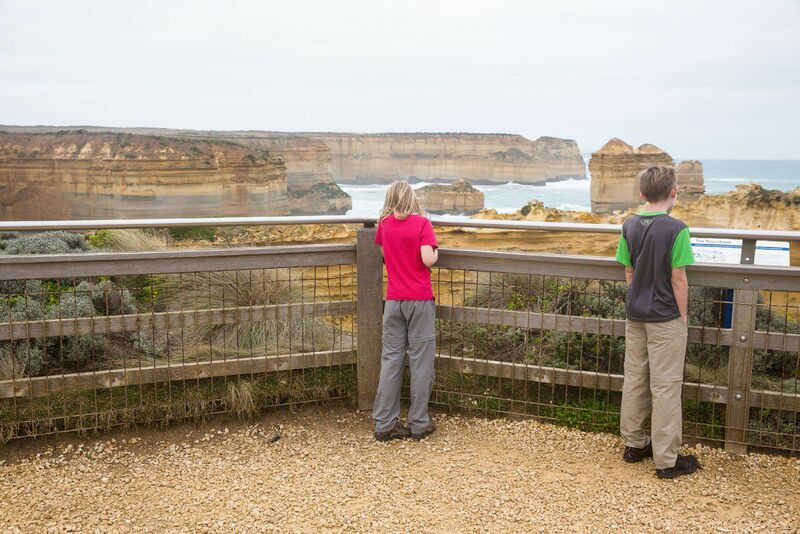 To get more information on the Great Ocean Road, visit the official tourism website here. 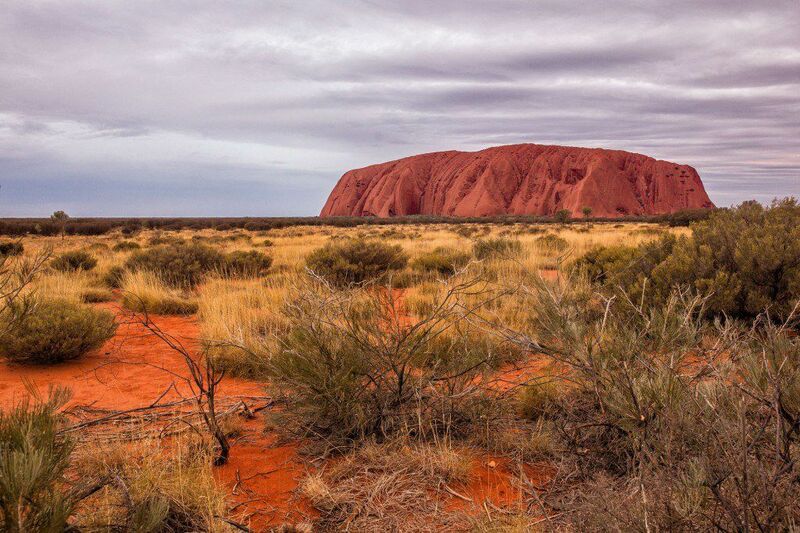 Australia: Is King’s Canyon Worth It? Have enjoyed your stories since departing Columbia almost a year ago. What kind of still camera/lens are you finding most helpful? I am using a Canon 5D Mark iii with a 20-70 mm lens. It is a beast to carry around with me everyday but I love the photos get with it. I’ve so enjoyed the magnificent stories of your world tours and the stunning photos. I am not looking forward to the conclusion of your trek. Would like to know what kind of still camera and lens you are using.